This entry was posted in Personal stories on 2018/02/07 by Susan. Have you ever wondered about the name of the Ironworkers Memorial bridge? This video shares stories from some workers who survived its collapse in 1958. The worst industrial disaster in Vancouver’s history happened on June 17, 1958, when one of the spans being constructed for the new Second Narrows Bridge collapsed. Seventy-nine workers plunged into the inlet 175 feet below. Eighteen of them died almost instantly; a diver also died in the aftermath. 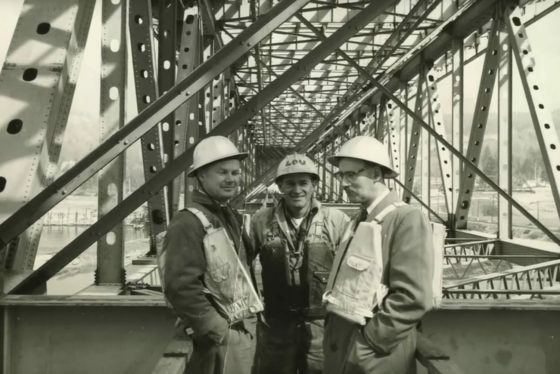 Recently I watched the Ironworkers Memorial Bridge Tribute, a WorkSafeBC video included on the website of the BC Labour Heritage Centre. After hearing three brave survivors tell their stories of the fall, I will think differently about that bridge every time I cross it. In the video, a survivor says he that when he hit the water, “The tide was coming in … my life jacket was ripped off of me, I hung onto it, I grabbed a two-by-four. I couldn’t see nobody else.” One describes cutting his belt and gear loose, everything but his buoyancy vest, so he rose to the surface. Another says that coming to the surface of the water he felt stunned, and clung to floating debris until a boat of rescuers fished him out of the water. In 1994, the Second Narrows Bridge was renamed the Ironworkers Memorial Second Narrows Crossing, to honour the workers who died in the collapse and four others who died during the years of construction. Today the bridge is known by both names, often shortened to “The Ironworkers” in radio traffic reports. Tens of thousands of people drive on it daily. The voices of these survivors will stay with me – the details of how they were able to save themselves while, sadly, so many others could not. Thanks to the BC Labour Heritage Centre and WorkSafeBC for preserving this important piece of local history that must not be forgotten. Watch the video to learn more. Read more about safety for people building structures in my post Building safety by design.